Beni Wins ArtsNL Arts Achievement Award! — Wonderbolt Productions Inc.
Beni Wins ArtsNL Arts Achievement Award! Beni Malone remembers exactly when he became entranced with the performance world. “It was the summer of 1974 when Dudley Cox was doing his travelling show, The Newfoundland Travelling Theatre Company1; I went on the road with them as a stage hand,” shares Malone. They built a large wooden stage, which would be set up and dismantled every time in each school gym. “I also remember these handmade batiks with depictions of NL history, just gorgeous; we would string them up with lights. We worked hard as stage hands, lots of grunt work, and I learned a great deal. That is a lot of physical work, let me tell you. It was exhausting,” laughs Malone. But he believed he had found his niche. That fall he joined the troupe as an actor and performed in the Christmas Pageant. But he wanted more. He wanted the credibility that would come with professional training. The four-month boot camp – from 8am to 9pm six days a week – was everything. Malone came home to St. John’s with his newfound training and formed his own company in 1981, calling it Clownburst. “We decided we would put together a little circus show to bring to the places in Newfoundland and Labrador you could only get to by boat,” says Malone. This flash of inspiration became the vision of community outreach for the company that became The Wonderbolt Circus in 1982 and still continues today. Malone continued honing his craft, studying at the Three Schools of Art in Toronto, and L'ecole Nationale Du Cirque in Paris, France, returning home every time to infuse his new knowledge into Wonderbolt, establishing professional clowning and circus arts in Newfoundland and Labrador. He wrote a variety of critically acclaimed shows including Reunion At Purgatory High, with Mark Critch, All Fool’s Day, and Wunderground, an original show for the GEO Centre. Wonderbolt’s show Tricksters was performed at the Vancouver 2010 Cultural Olympiad, and their circus shows Cirkzilla and Bolt Out of the Blue toured extensively through 2012 to 2016. Today, Wonderbolt has a vibrant Circus School in St. John’s, offering summer and after-school camps for children and providing programs and opportunities for a wide spectrum of interests and ages, from toddlers to seniors. The troupe tours across the country and invites international artists to join them for productions here and abroad. Yet it’s the remote places of our wondrous province that still keep drawing Malone. He has developed curriculum-based circus arts programs for physical education classes of all levels – positive, focused, gender inclusive physical arts programs that provide multiple doorways for participation and has given youth a whole new perspective on physical activity. In 2005 Malone began working with the Innu Education Authority to create a performing arts program for their students. He also was instrumental in setting up the Kamataukashiuat Arts Festival in Sheshatshiu and Natuashish, Labrador, which ran for nine years. In 2006 he was awarded the Arts In Education Award by the Newfoundland and Labrador Arts Council for his innovative programs. In 2016 he began working with the Nunatsiavut Government and Northern Lights Academy in Rigolet to develop a circus/physical arts program along the remote northern coast of Labrador. This project has now being expanded with the intention of including all communities in Nunatsiavut. Malone has invented new and exciting performances in each of Wonderbolt’s 35 years for captivated audiences throughout the province. For example, their homage to the Golden Age of Circus, Circus Glorious! toured Arts and Culture Centres throughout the province and featured local, national and international artists, complete with technicolor costumes, jaw dropping aerial acts, interactive clowning, sophisticated choreography and original music. In January, Wonderbolt premiered a new show, All Fired Up, as the highlight of the St. John’s New Year’s Eve Canada 150 celebrations before thousands of spectators at an outdoor stage at City Hall. The Arts Achievement Award, for which Malone is nominated, recognizes a practicing artist who has made an outstanding contribution to the cultural life of Newfoundland and Labrador over a number of years. And Beni Malone, through his Wonderbolt Circus, has made outstanding contributions to wellness and participation of our communities through the arts. Indeed, Wonderbolt is woven into the fabric of our culture for more than 35 years. Malone says he is thrilled to be nominated for an ArtsNL Award amongst very noteworthy artists this year; those recognized in past years include Michael Crummey, Barbara Doran, Ron Hynes, Andy Jones, Anita Best and Helen Porter, among other notable luminaries. Wonderbolt has some exciting things coming up… June 16 sees their annual fundraiser gala take place at their Wonderbolt location, The Space, on Harbour Drive – this year with a 20s and 30s themed event.  And a big announcement is coming with regard to an international circus festival this fall. Serendipitously, Wonderbolt and ArtsNL are both celebrating 35 years of contribution to the arts and culture of this province.